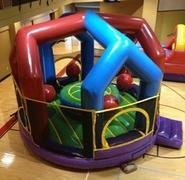 This Wrecking Ball – Joust Combo rental is brand new to the party rental scene and can only be found here at Eastern Shore Inflatables. The Wrecking Ball game involves 3-5 players. One player stands on the pedestal in the middle of the ring while players from the outside swing large, soft tethered balls at them trying to knock them off. The Joust is just like the one you remember from TV. Contestants try to knock each other off the jousting platforms to declare victory. This Wrecking Ball – Joust Combination is perfect for any age. The pedestals and poles are nice and soft as well as the inflatable area that each contestant falls on.